Police have confirmed they are now investigating the discovery of two car bombs in the West End of London. 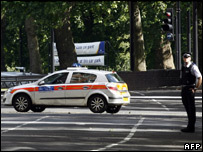 Police said the second device had been found in a Mercedes hours after the car was given a parking ticket in Cockspur Street and towed to Park Lane. 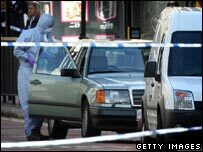 Another Mercedes, with a bomb made up of 60 litres of petrol, gas cylinders and nails, had been found outside a nightclub in Haymarket at 0130 BST. Both bombs were similar, potentially viable and clearly linked, police said. At a news conference on Friday evening, Deputy Assistant Commissioner Peter Clarke, head of Scotland Yard's counter-terrorism command, said the discovery of the second device was "obviously troubling" and "reinforces the need for the public to be alert". "There was a considerable amount of fuel and gas canisters, as in the first vehicle. There was also a substantial quantity of nails," he said. Speaking earlier about the first bomb, DAC Clarke said: "It is obvious that if the device had detonated there could have been serious injury or loss of life." Police sources said it would have caused "carnage" if it had exploded. "International elements" were believed to have been involved with the bombs, Whitehall sources told the BBC. The government's emergencies committee, known as Cobra, will be meeting on Saturday morning to discuss the attempted bombings, the BBC's political editor Nick Robinson said. The meeting could be chaired by either Prime Minister Gordon Brown, who is not cancelling any planned engagements, or Home Secretary Jacqui Smith. Mr Brown said Britain faced "a serious and continuous threat" and the public needed "to be alert" at all times. The second bomb was found several hours after bomb disposal experts had defused the first bomb outside the busy Tiger Tiger nightclub in Haymarket. It was discovered in a blue 280E model Mercedes in a Park Lane car pound, where it had been towed after being given a ticket for illegally parking in Cockspur Street, near Trafalgar Square. Police were alerted after staff who had heard about the Haymarket bomb noticed a strong smell of petrol coming from it. Park Lane was closed for much of the afternoon while bomb squad officers checked the vehicle. It was eventually reopened at 1930 BST. The Haymarket area was also cordoned off as police carried out forensic searches. Officers had been alerted to the first bomb by an ambulance crew who had been called to Tiger Tiger nightclub to deal with a separate incident. They had spotted smoke - now believed to have been vapour from the petrol in the car - inside a metallic green Mercedes parked outside the club. Bomb experts manually disabled the device. Scotland Yard declined to comment on reports a mobile phone was found in the Mercedes that may have been intended to trigger the explosion. Mobiles have been used to detonate bombs in Iraq and Indonesia and in other terror attacks, such as the 2004 Madrid bombings. Police disable device in green Mercedes. 1000 Prime Minister Gordon Brown says country faces "serious threat"
Both cars have been taken away for forensic examination and CCTV footage from Haymarket is being analysed. Police are believed to be making some progress towards producing an image of the driver. The attempted car bombings have echoes of other foiled terror plots. Five men were jailed for life in April for a UK bomb plot linked to al-Qaeda that targeted a shopping centre and a nightclub with a giant fertiliser bomb. And Dhiren Barot was jailed for life last November for conspiring to park limousines packed with gas canisters underneath high-profile buildings before detonating them. DAC Clarke said it was too early to say who was responsible but the Haymarket incident "resonated" with previous cases. Speaking in Downing Street after meeting the prime minister and the new Home Office minister for security, Admiral Sir Alan West, Home Secretary Jacqui Smith urged members of the public to report anything suspicious to the police. The BBC's Andy Tighe said the timing of the car bombs was significant coming two days after Mr Brown became prime minister, and with the second anniversary of the 7 July bombings approaching. The current terror threat level has been classed severe - one level lower than the highest "critical" - since 14 August 2006. Metropolitan Police Assistant Commissioner Tarique Ghaffur urged people to be "alert and vigilant" and report anything suspicious to police. Disruption would be kept to a minimum, he said, although the police were reviewing the safety of big public events taking place in the capital over the weekend. "I want to reassure Londoners that we are doing everything possible to make them safe," he added. Following Friday's discoveries, police patrols in central London were stepped up "to provide a visible reassurance", rather than in response to a specific threat. Officers were visiting licensed premises to reiterate crime prevention and safety advice, said a police spokesman. Police have urged anyone with information to phone the confidential Anti-Terrorist hotline number on 0800789321. You can send pictures and video to: yourpics@bbc.co.uk or to send via MMS please dial 61124. Do not endanger yourself or others, take any unnecessary risks or infringe any laws. The BBC may edit your comments and cannot guarantee that all emails will be published. Who are the bomb suspects? How is Brown coping with crisis?